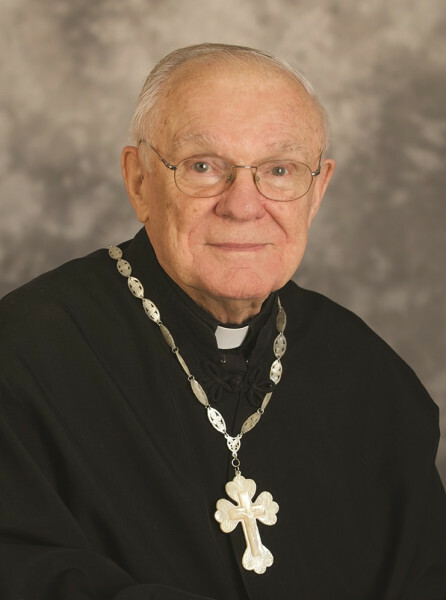 Archpriest John Mason, 90, fell asleep in the Lord on Thursday, January 31, 2019. Father John served parishes in Robins, OH; Altoona, PA; Meriden CT; Akron/Mogadore, OH; Yonkers, NY; and Wilkes Barre, PA. Upon retiring to Hagerstown, MD, he continued serving at area parishes of several jurisdictions. After the repose of his beloved wife of 63 years, Father John moved back to his former parish of Saint Nicholas, Mogadore, OH, where he was attached. On Saint Nicholas Day—December 6, 2018, he became the first priest of the Diocese of the Midwest to be awarded the Order of Saint John of Chicago in honor of his 67 years in the priesthood. Father John is survived by his children, Deborah, Cuyahoga Falls, OH; Gregory [Susan] Mason, Lexington, KY; Tamara [Mark Kocsis], Long Beach, CA; and Susan, Lake Worth, FL; his daughter-in-law, Mary Susan, Raleigh, NC; his grandchildren Katrina, Nicholas [Rachel] and Natalie [Joe] Kennedy; his step-grandchildren Jason, Rebecca and Emily; and his brother, Archpriest James [Patricia], Easton, PA. He was predeceased by his wife, Matushka Doris, in 2014; their son Serge in 2003; and his sister Kathryn in 2017. Visitation will begin at 5:00 p.m.on Monday, February 4, at Saint Nicholas Church, 755 South Cleveland Ave., Mogadore, OH, with the Funeral Service for a Priest slated to be celebrated at 7:00 p.m. On Tuesday, February 5, visitation will begin at 8:00 a.m., followed by the Divine Liturgy at 9:00 a.m. His Grace, Bishop Paul will preside at all services. Interment will be at Saint Tikhon’s Monastery Cemetery, South Canaan, PA.